Once per turn: You can detach 2 Xyz Materials from this card; Special Summon as many “Battle Eagle Tokens” (Machine-Type/WIND/Level 6/ATK 2000/DEF 0) as possible, destroy them during the End Phase of this turn, also your opponent takes no further battle damage this turn. Number 42: Galaxy Tomahawk is our Throwback Thursday choice, and one that may see itself on the banlist eventually. 2 Level 7 monsters is easier for some decks, but not universally, so this helps with its amazing effect. For both materials you fill your Main Monster Zones with Battle Eagle Tokens. These tokens can be used for anything, and being Level 6 and Machine, there are several ways to devastate your opponent. The most common thing done with these tokens is a mass amount of Link Summoning. Tomahawk and a token or more go bye bye for a Link, use the leftover tokens for link summons, Special Summon some more and finish up your turn. You are going to make Tomahawk in Main Phase 2 so you can offset the “no further battle damage” effect this card has. The tokens also get lost at the end of your turn, so you need to use them or you lose them. The link capabilities from this card are too good, and Tomahawk itself can sit with a massive defense stat to protect you. The tokens are 2000ATK and can run over a decent number of meta monsters, and, as mentioned before, the Link and Synchro capabilities are just bananas with this card. Too much potential with this card not to be hit by the banlist, even if the easiest way making this is with Level 7’s. Number 42: Galaxy Tomahawk is a Rank 7 Wind Machine-type XYZ Monster with 0 Atk and 3000 Def. 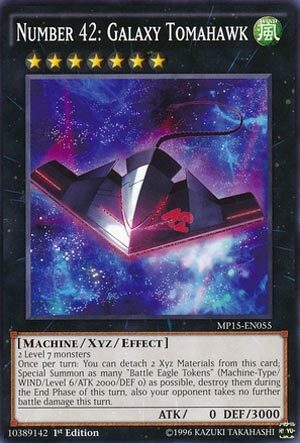 It’s generic requiring any 2 Level 7 monsters, although it’s supposed to be related to the Galaxy archetype. Instead, it’s the Battle Eagle Tokens with their 2000 Atk that can be used to Special Summon Galaxy-Eyes Photon Dragon, but that’s not why we’re reviewing Tomahawk. At the cost of 2 materials you can summon up to 5 of the Level 6 Wind Machine-type tokens with 0 Def. They are destroyed during the End Phase and your opponent takes no further Battle Damage. Otherwise the tokens can be used for anything, which wasn’t intended for Links, but makes that job very easy. As soon as there is a burner Link Archetype, Tomahawk will probably be banned. Until then, activate this during Turn 1 so the Battle Damage clause means nothing. Or just do it during the second Main Phase and end with an unbreakable board. Unbreakable board monster creators score well, artwork is a plus as well. Throwback Thursday today and I decided to look at a card that was fine for the time it was printed, but now can arguably be broken with Link Summoning, Number 42: Galaxy Tomahawk. Number 42 is a Rank 7 WIND Machine with 0 ATK and 3000 DEF and requires 2 Level 7 Monsters. ATK isn’t great, but DEF is, but these stats won’t matter if you use it for Link Material. WIND isn’t too beneficial of an attribute, but Machine is a great type. You can detach 2 materials from Tomahawk to Special Summon as many Battle Eagle Tokens (Machine/WIND/Level 6/ATK 2000/DEF 0) as possible, but destroy them during the End Phase of the turn and your opponent takes no battle damage for the remainder of the turn. Back when this was first printed, it was best used for the Blaze Fenix FTK/OTK, which might not be as possible without Ancient Fairy Dragon. After Master Rule 4, this is very powerful for Link Spam. You can easily get a Link-4 and a Link-2 with this at the bare minimum. There are so many options I won’t go down the list of them. Sure some Links prevent the use of Tokens or monsters with the same name, but using the Tokens for Link Monsters just to go into bigger Link Monsters is also an option. Galaxy Tomahawk has gained new power with Master Rule 4 and as the Link Pool and overall Card Pool expands, it could become a problem and I wouldn’t be stunned to see it banned like many other Token generating cards. Art: 3.5/5 A pretty lazy looking ship, but not terrible art. A beastly Monster with 3000 defense, are we looking at Ascension Sky Dragon again? No, this is Number 42: Galaxy Tomahawk for Throwback Thursday. Rank 7, Wind, Machine, 0 attack but a behemoth 3000 defense. Generic XYZ requirement of just two Level 7 Monsters for the XYZ Summon. By detaching both XYZ Material, you get to Special Summon as many Battle Edge Tokens as possible. Stats on said tokens are Level 6, Machine, Wind type, 2000 atk and 0 defense. That’s potentially 4 free tokens, which is just screaming for abuse. This effect does prevent your opponent from taking any more Battle Damage this turn, but emphasize that’s just BATTLE Damage. This card certainly has OTK capability even regardless of that, in ways of burn Damage, if possible. Things like Cannon Soldier (and/or his Toon counterpart) help with this, as often found in OTK Decks (though both are currently Banned in the OCG at present, done recently, I believe). But the door is open for these Tokens, there’s no restriction what you can do with them. They could be attackers, you’re still allowed to do Battle, (you just aren’t doing Damage) so it could be a quick field clear. You can Synchro, XYZ, Link Summon and Spam with these Tokens as well. The card certainly has a LOT of potential. Art: 5/5 I do like the picture, the color here, but that doesn’t resemble a tomahawk to me in any way, whatsoever.